BEST BROWN: 3lbs 12oz Mr ? Sport: The best catch over the last few days went to Ian Muir who fished around Gull Island and the Northern Shallows with a Di5 sinking line and two cat boobies. Frank retrieved them back slowly to take 12 good trout. His two friends fished similar methods and also had a good day with nine to their boat. Good angling fellers. Today the boat anglers were targeting rising trout taking very small black midges around the margins. At Grindy’s Lawn there were lots rising, but they proved tricky to catch, claret hoppers were most effective. I remember a couple of season ago in similar conditions, also when the level was also low. Paul Bebb had a cricket score fishing a team of three claret hoppers on a floater. He cast them to the shore and twiddled them back just subsurface. It’s definitely worth a try if you’re planning a visit. It’s easy to dismiss these subtle rises close in as small wild brownies but, more often than not, they are decent sized rainbows. 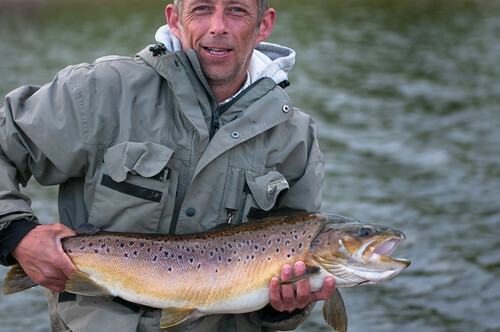 From the shore, although it’s not been easy, most anglers have been rewarded with a fish or two. Mick Glancey took five trout from two trees and Frank Thompson took four on cormorants along Ben’s Beach also on a half day ticket. Today Norman Walker took three rainbows from Bell Point on an orange fritz and Antoon Gysbers caught two and lost another two in a short session this morning. Antoon started out with a bumble on the point and two red headed diawl bachs on the droppers and worked his way along Hartley’s. After an hour or so he hadn’t had any luck so put a gold headed ptn on the point. Over the next hour he landed two and dropped two more before it was time to go. Antoon always fishes a floating line and uses a very slow retrieve and he usually gets his fish. The best fish of the week was caught today, a cracking 9lb 8oz rainbow by Mark Mayors. Mark was targeting the rising trout in the margins between two trees and the boat jetty when a big rainbow cruised past just subsurface. He presented a Griffiths Gnat into its path and twiddled it until it went under. The big rainbow bee lined for the fly and took it well. It didn’t realise it was hooked at first, but when it did, it set off for parts unknown. Good angling Mark. This entry was posted in Stocks Reservoir Fishing Reports on September 19, 2014 by staff. Sport continues to be ‘hard’ at Stocks as it appears to be at all other venues up and down the land, with a few exceptions I’m sure. The recent warm and bright summer weather we’ve been enjoying coupled with the warm water temperatures and high pressure are all playing a part. The fish are there and they are moving however feeding seems to come in short bursts, making it difficult to predict where and when. All this having been said, anglers are still finding fish and catching them. The margins are where the majority of fish are being caught with the bank and boat rod averages being pretty equal. Where the boats are at a distinct advantage is the open water between the causeway and the northern end of gull island, with reasonable numbers of fish being caught on dries. Daddies and hoppers remain favourites. The fish seem to be well spread out and high in the water across this whole large area. On the bank the best catches are being found in the ever popular dam and grindys lawn area, and more recently up the east bank under The Alders. Buzzers and traditional wets are scoring well off Grindy’s Lawn. The bridge in Newton is now reopened so no need to follow the diversion for those that approach from the south; good news for all. See you on the water and keep your eyes open for the Osprey; sightings are daily. This entry was posted in Stocks Reservoir Fishing Reports on September 14, 2014 by staff. Sport: The weather has been great over the last few days, not much cloud cover but great to be out on the water. We have had a big fall of flying ants and the trout have been quick to take advantage of them. The calm areas at the top of the wind have been the most productive places, namely, Cook’s Creek, The Willows, Blackhouse Bay and the Alders. There have also been some great calm lanes across the northern shallows and from the east bank to Hollins Bay. These lanes gather insects blown in from the surrounding water and quickly become hotspots. On my way around the boats in the afternoon several of them were enthusing about the number of fish rising and having to choose which rising trout to cover, and others were saying that they hadn’t seen a fish. So it’s important to move if you’re not catching. Paul Bebb was out on Wednesday with Dave Watson, they had ten rainbows and blues to their boat, all of which came to dries. Their best areas were Cook’s Creek, the Northern Shallows, Gull Island and The Boulders. They caught on Daddies, Hoppers and bits. On the shore the top rod was Keith Landless who fished small black buzzers with a chartreuse hot spot head from Bell Point to take 6 good rainbows to 3lbs. On Thursday the top rod from the boats. Geoff Thomas took 7 trout on dries in just half a day. Geoff’s best patterns were red Midas and daddies. NB* We also have 3 open competitions between now and the end of October. This entry was posted in Stocks Reservoir Fishing Reports on September 5, 2014 by staff. DATE: Saturday August 30th to Tuesday September 2nd. NOTABLE CATCH: 7 trout for Bob Fitzpatrick. NOTABLE BAG: 5 fish for 12lbs 12oz to Paul Higginson. BEST RAINBOW: 5lbs 8oz to Derek Moore. BEST BLUE: 3lbs 8oz to Joe Halton. BEST BROWN: 3lbs 0oz to Luke Knipe. BANK ROD AV: 2.08 fish per angler. BOAT ROD AV: 2.00 fish per angler. Sport: Not bad weather again with good temperatures and plenty of sunshine. There have been some reasonable catches made over the last few days and some decent fish caught with rainbows browns and blues all being caught up to and over the 3lb mark. Derek Critchley and Barry foster took to a boat and caught 8 fish between them. They fished off Bell point and Bens beach and caught all their fish on diawl bachs. Bob Fitzpatrick caught 7 fish whilst drifting all over the water. Bob washing lined diawl bachs and caught on both the nymphs and the booby. Bobs best areas were over the saddle and tight in along the east bank. Fishing from the bank at 2 trees was Terry Whittaker who landed 5 fish. As with other anglers diawl bach was his best fly. Daiwl bach has been probably the best fly over the last couple of days closely followed by various dries including daddies and black or bibio hoppers. The best spots from the bank has been from the jetty round to Bell point and the dam and Grindys with the boats favouring the dam area and along the east bank from the alders to currys cast. There were flying ants on the water today and the trout would rise to these even in the bright sunshine. The weather is supposed to be nice all week, with a bit of cloud we could see some good dry fly action. Ben made another stocking again today. See you on the water Paul. This entry was posted in Stocks Reservoir Fishing Reports on September 2, 2014 by staff.